An animal's color and patterning is often essential to its survival and reproduction, functioning in camouflage, mimicry, social and sexual signaling, and thermoregulation. Color thus provides a powerful lens through which to investigate the behavior, ecology and evolution of diverse animals. Using birds as a model system, we have asked: How colorful are birds? How have pigmentary and structural colors contributed to the expansion of the avian plumage palette? What are the functions of eggshell color and patterning? How does iridescence evolve? Current work in the lab explores plumage evolution in woodpeckers, parrots, warblers and hummingbirds. We have also helped to develop new conceptual frameworks and software tools for the study of animal color and pattern in nature (Stoddard & Prum 2008, Stoddard et al. 2014, Stoddard & Osorio 2018), and we are devising new imaging and optical equipment in the lab. Birds possess an ancient and sophisticated visual system that differs dramatically from our own. Unlike humans, birds have a fourth color cone in their retinas that is sensitive to ultraviolet wavelengths. Most diurnal birds thus appear to be tetrachromatic (four color cone-types), compared to trichromatic humans. To estimate the appearance of colors in way that is relevant to bird vision, we use a quantitative model of avian tetrahedral color space – for which we developed the TetraColorSpace computer program (Stoddard & Prum 2008). To test these and other models of color vision in the wild, we have started a new research program on Broad-tailed Hummingbirds at the Rocky Mountain Biological Laboratory in Gothic, Colorado. Hummingbirds use color to find flowers and to woo mates, making them excellent candidates for work on the mechanisms of color perception in a natural setting. Bird eggshells are remarkable feats of engineering: they are strong and lightweight, but also breakable. Why do bird eggs come in such a variety of shapes, from near-spherical in owls to pointy and elongated in guillemots? To answer this question, we quantified the shapes of nearly 50,000 eggs representing 1400 species. We performed a large comparative analysis, which revealed that a bird's flight ability is correlated with egg shape, and proposed a new mechanistic explanation for egg shape formation (Stoddard et al. 2017). We are also interested in the crystal ultrastructure and mechanical properties of eggshell, a topic we are investigating with engineers and biophysicists. A Reed Warbler feeds a Common Cuckoo chick. Avian brood parasites, like the notorious Common Cuckoo, and their hosts provide an especially compelling system in which to study visual signaling and pattern recognition. In many cases, the brood parasite has evolved deceptive visual signals, like egg mimicry, that push the host's recognition abilities to their limits. Previously, we developed a new computational tool NaturePatternMatch for analyzing egg patterns, and we found that some host species parasitized by the Common Cuckoo have evolved recognizable egg pattern signatures in response to cuckoo egg mimicry (Stoddard et al. 2014). We are now investigating the extent to which color and pattern cues influence egg recognition in other systems, including Cuckoo Finches and Tawny-flanked Prinias, with collaborators in the UK and South Africa. A male Broad-tailed Hummingbird foraging. Hummingbirds are highly visual animals that rely on color for foraging and sexual and social signaling. 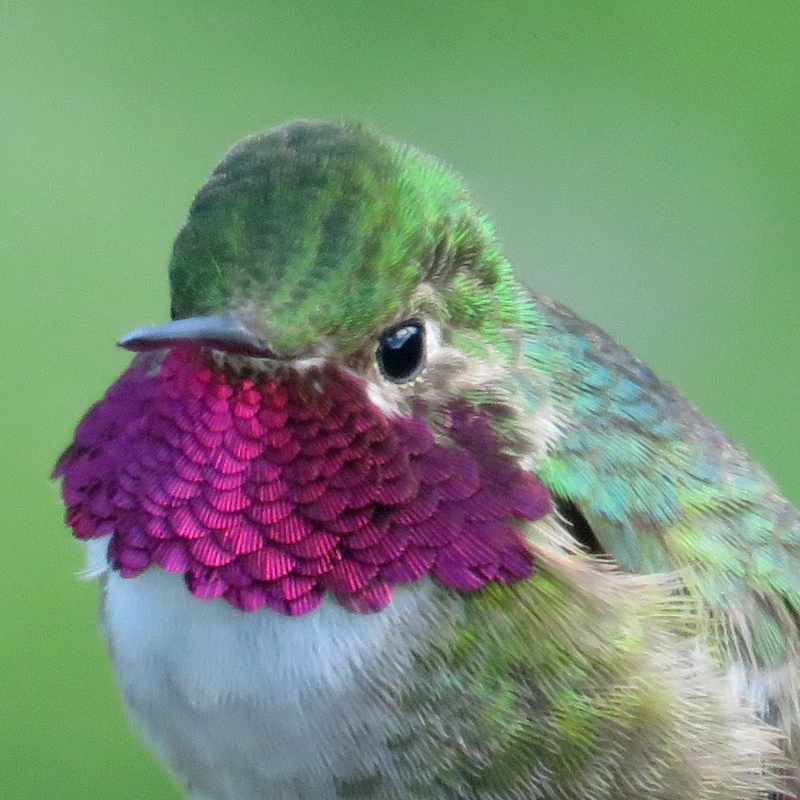 To complement our work on color vision (see above), we are currently investigating the foraging ecology and courtship behavior of Broad-tailed Hummingbirds at the Rocky Mountain Biological Laboratory. What wildflowers do hummingbirds pollinate throughout the breeding season, and how might this be impacted by climate change? How might male hummingbirds, which perform spectacular courtship dives to females, combine speed, sound and iridescent color in their displays? These are questions we are actively exploring in the field. Want to learn more? Check out our publications.